Culture Shock » #240 Mission Accomplished. I’m going to be at E3 for the majority of this week. And I’m driving there! But don’t worry, I’ve worked extra hard and gotten ahead in pages, so your reading of Culture Shock should be relatively uninterrupted. You know, Tadashi’s friend seems very… disposable based on the situation. This seems like it’s either leading to his death by the woman with witch eyes, or him trying to find a partner. 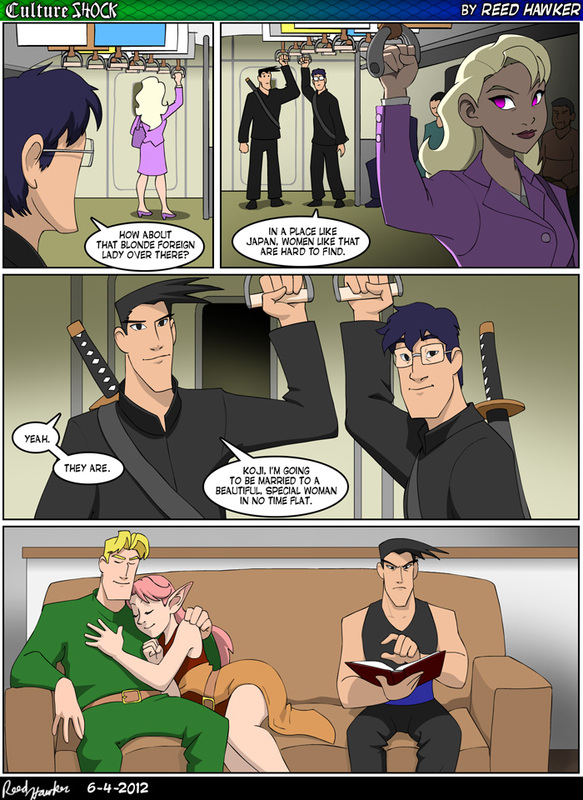 I can see why Tadashi is annoyed in the last panel, he has a book, while Alec has Brooke. What, no comment on how the ‘blonde foreign lady’ seems a lot like the witch? I’m guessing that she has something to do with Tadashi being in America.